Absolute Home Solutions is your Gutter Repair and Seamless Gutters installation Experts. We service and install a wide variety of copper gutters, aluminum, galvanized, seamless gutters, water diverters and leaf protection devices. While seamless gutters are the most popular, copper gutters as well as galvanized are gaining popularity on certain home styles. Seamless gutters now come in many different sizes, weights, and colors. With the various designs and colors available we are sure to have a system to match your home’s exterior décor. A functioning water collection and diverter system is important to collect the rainwater that would otherwise run off of your roof and possibly allow water to penetrate into your home, attic or foundation. Properly installed gutters will greatly reduce the risk of water penetration and moisture problems by collecting and diverting water away from sensitive areas around your roof and property. Most water damage starts around the roof structure such as around windows, fascia, soffits and foundations. Seamless Gutters and downspouts provide an easy solution to collect and divert this water for proper drainage away from home and foundations. In addition to protecting your home from water intrusion it is also important to protect your mechanical equipment from rain water run off. Equipment such as air conditioning compressors, pool equipment, sprinkler pumps, electrical boxes, heaters and other equipment will last longer if water is diverted away from the electrical components of your equipment. A proper installation consists of several components including straight sections, inside corners, outside corners, end caps, hangers and leaf screens. Downspout components consist of straight downspout sections, elbows, straps and a splash block. The straight sections or “trough” sections are the primary piece of the system. These sections usually come in 10′ lengths and can be joined together if a longer section is required. A joiner is used to connect the two sections to form a longer length. many companies have a machine that forms the trough section on site, from a roll of aluminum. Almost any length can be extruded from the machine. Since this system is cut to length they are called “seamless gutters”. Once all of the components are properly installed you will have a functioning system capable of catching and diverting all of the water away from low lying, and collection areas. When installing your system it is also important to slant your system towards the downspout. Without proper slope towards the downspout the water will back up and not drain properly. It is also important to get all of your parts from the same manufacturer. While all of the parts are basically the same different manufacturers have slightly different sizes and shapes. While this is not an issue with seamless systems it is important with the more traditional installations. Gutters do periodically require maintenance and repair. Often times you may need maintenance and gutter repair without even knowing it. Many times this is too late. Maintenance and repair while not difficult is important. When not functioning properly your system will overflow or leak often times letting water penetrate into the structure of your home. This added moisture or water intrusion may cause severe water damage or even mold. Keeping your gutter clean, leak free and properly supported is important for your system to function properly. Our professional gutter repair department handles all of your seamless gutter repair calls. We gladly service, repair and clean your existing gutters to insure years of service and water protection. If you see any signs of water overflowing or leaking from around the joints of your system its time to call our repair team. Copper gutters can increase the value and appearance of your home. While copper gutters are slightly more expensive and more difficult to work with they have a lasting affect on your home. Copper gutters with age will turn to a great looking patina color which is desired by those who prefer the look of copper gutters. If you are looking to spruce up the look of your home and have a conversation piece among your neighbors try installing copper gutters. For a free assessment of your water runoff and need for gutters installed at your home please call Absolute Home Solutions. If you are experiencing any water accumulation in areas that should not hold water it is time for a water run off system. We are your professional home solution service contractor providing seamless gutters and repairs throughout Washington DC, Maryland and Northern Virginia. 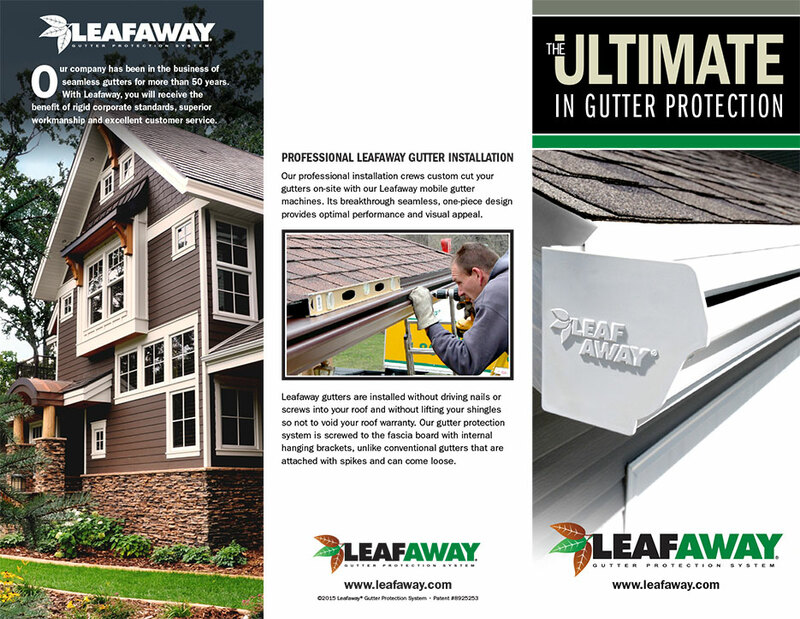 Aside from preventing clogged gutters, the LEAFAWAY® Gutter Protection System also offers many other benefits. The upper portion of your home will be protected from rotted soffit and fascia boards, rain soaked ceilings, mold in the attic and ice damming in the gutters themselves. Your unclogged gutters will always be able to maintain maximum water capacity and prevent rain water run-off which can lead to cracks in the foundation and damage to landscaping. 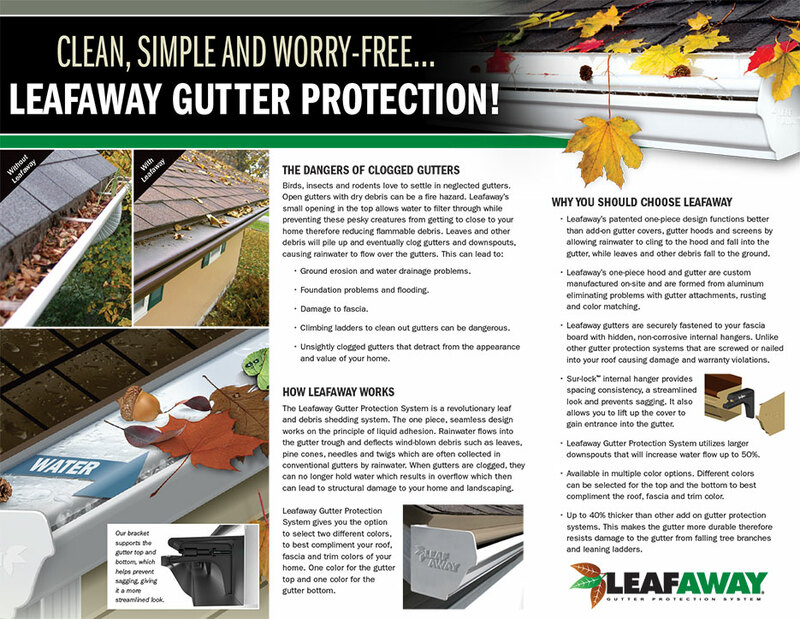 The LEAFAWAY® Gutter Protection System is also seamless which means no leaks and no maintenance. Your days of climbing ladders to clean your gutters are over. And to top it all off, the LEAFAWAY® Gutter Protection System looks great! The wide variety of color combinations is the perfect finishing touch to any home.